THREE RIVERS, Calif. — Picture a 27-story building that is wider than a three-lane highway. Welcome to Grant Grove, home of General Grant Tree. “Forty five-room houses could be built from the wood of this tree,” said Park Ranger Frank Helling. In addition to this massive tree, there are a lot of other attractions as well, such as the Gamlin Cabin and Centennial Stump. Not only does this grove contain magnificent trees and other attractions, but it also has a deep history, going back thousands of years. 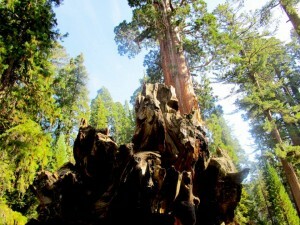 At right, General Grant Tree in Grant Grove of Kings Canyon National Park. Below, a view of the mountains on the drive to Grant Grove (Photos by by Melissa Ostroff). Before Europeans discovered what would become Sequoia and Kings Canyon National Parks, Native Americans were the primary residents of this area. It was in 1846 that a man named Hale Tharp discovered the area, hoping to develop a cattle ranch. As more Europeans began to settle in the area, the Native American population dwindled, mainly due to the deadly diseases that came from the early European settlers. The remaining Native Americans left, realizing that it was their only chance of avoiding the foreign diseases to which their bodies were not accustomed. With this movement, Grant Grove was used primarily for cattle ranchers and timber harvesters. It wasn’t until 1940 that Kings Canyon National Park was officially established, with Grant Grove as a subset of this enormous park. Companion Sequoia National Park, however, is much older, being created with Yosemite National Park in 1890. Discovered by Joseph Hardin Thomas in 1862, General Grant Tree towers high above its visitors, who travel from all over the world to see it. The largest tree in Grant Grove and the third largest tree in the world, it is named after President Ulysses S. Grant, who served just prior to creation of the park. Rising 268 feet and nearly 20 centuries old, the General Grant Tree has truly stood the test of time. Dubbed the “Nation’s Christmas Tree” by President Calvin Coolidge in the 1920s, the tree brings together the nearby community every year for Christmas celebrations. Another unique site in Grant Grove is the Gamlin Cabin, created by the Gamlin Brothers in 1872. However, in 1878 they were kicked off of their own property. 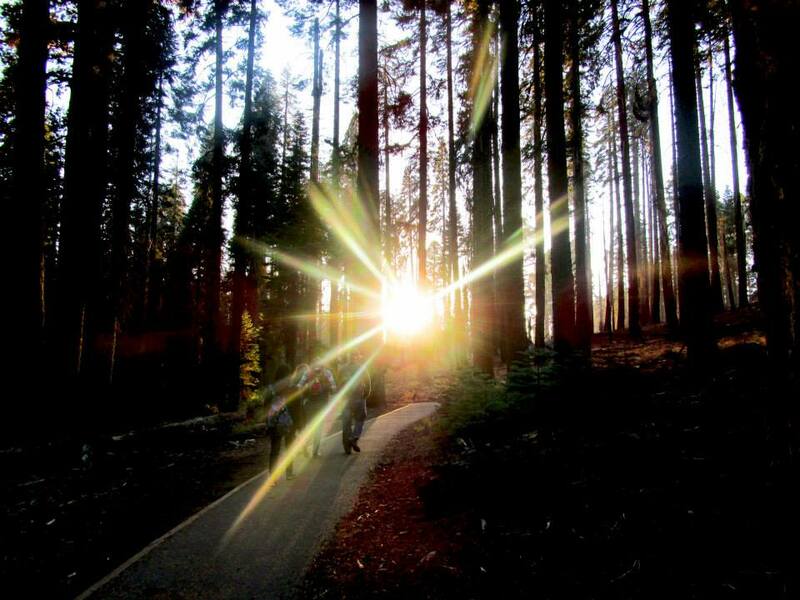 A trail within Sequoia and Kings Canyon National Parks at sunset. Although the cabin has been moved three times and there have been some repairs due to termite damage, it remains similar to its original form today. The United States Cavalry also used this cabin as a warehouse in the early 1900s. It was also the home of Lewis L. Davis, the original civilian ranger. At one point, a tree fell on the cabin. However, the cabin was not badly damaged. Since the 1930s, it has been designated as a historic site and is no longer used as a warehouse or residential home. Although visiting a tree stump in the middle of a forest may not seem like an exciting adventure, the Centennial Stump and the story behind it are worth a visit. Although all that remains today of this tree is a rather large stump, it used to be a magnificent giant sequoia. Brothers William and Thomas Vivian chopped down this tree. Click on the video at left to view an audio slideshow about the Giant Forest prepared by writer Melissa Ostroff. However, the stump has not gone to total waste. In the past, Sunday school used to be held at the stump for the children of nearby logging camps. Another must-see when visiting Grant Grove is the Fallen Monarch, a hollowed out log (most likely from fire) of a giant sequoia. Luckily, when the tree fell, it was most likely during a recent snowfall, so it didn’t break when it landed. It has served many uses, including years as a horse stable; place of residence, and even as a small hotel. There is even a hole in the top that used to be for a chimney. 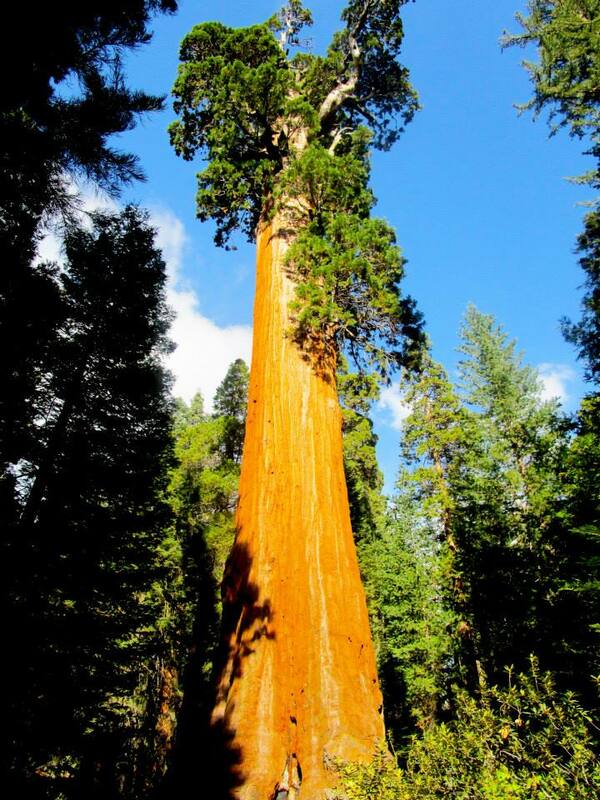 In addition to the attractions mentioned above, there are also many other trees to visit in Grant Grove besides General Grant, such as the Tennessee Tree, California Tree, Oregon View Tree, Lincoln Tree and the Twin Sisters. The entrance to the Fallen Monarch, a hollow giant sequoia. It has served as a horse stable, place of residence and even as a small hotel. Many of the trees have a story behind them; some of which are named because of the visitors. Ranger Helling mentioned a ranger by the name of Milo Decker, who will name a tree after any new state or country that a tour group is from when he brings them on a tour. For example, one of the trees is named the Hawaiian Tree because a group of children from a school in Molokai, Hawaii came to see the trees. They shared how these cruise ships were coming and dumping sewage in their water supply. The ranger was so touched by their story that he convinced the park to name a tree after these school children. Visitors come to Grant Grove not only to see the size and beauty of the trees, but also because of the great stories the trees have to tell, and the different people and events that they represent. These are not just trees, but reminders of different pieces of history, all fitting together into a very complex and intricate puzzle. 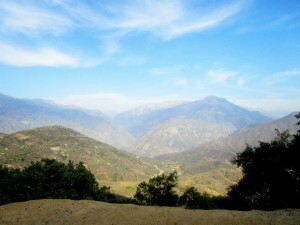 Kings Canyon Visitor Center (559-565-4307) is the main place where tourists can obtain information about Grant Grove. Where to stay: Winter: John Muir Lodge (559-335-5500); Summer: There are various cabins where visitors usually stay, if not the lodge, which is open all year. Grant Grove Village: Has a few restaurants, a marketplace, gift shop and post office. Picnic Spots: Columbine and Big Stump. Ranger Programs: Hours and types of programs vary, but the latest info can always be found on the visitor center website (http://www.visitsequoia.com/grant-grove-visitor-center.aspx).